Oslo (/ˈɒzloʊ/ OZ-loh, also US: /ˈɒsloʊ/ OSS-loh, Norwegian: [²ʊʂlʊ] (listen), rarely [²ʊslʊ, ˈʊʂlʊ]) is the capital and most populous city of Norway. It constitutes both a county and a municipality. Founded in the year 1040 as Ánslo, and established as a kaupstad or trading place in 1048 by Harald Hardrada, the city was elevated to a bishopric in 1070 and a capital under Haakon V of Norway around 1300. Personal unions with Denmark from 1397 to 1523 and again from 1536 to 1814 reduced its influence, and with Sweden from 1814 to 1905 it functioned as a co-official capital. After being destroyed by a fire in 1624, during the reign of King Christian IV, a new city was built closer to Akershus Fortress and named Christiania in the king's honour. It was established as a municipality (formannskapsdistrikt) on 1 January 1838. The city's name was spelled Kristiania between 1877 and 1897 by state and municipal authorities. In 1925 the city was renamed Oslo. As of 1 July 2017, the municipality of Oslo had a population of 672,061, while the population of the city's urban area of 3 December 2018 was 1,000,467. The metropolitan area had an estimated population of 1.71 million. The population was increasing at record rates during the early 2000s, making it the fastest growing major city in Europe at the time. This growth stems for the most part from international immigration and related high birth rates, but also from intra-national migration. The immigrant population in the city is growing somewhat faster than the Norwegian population, and in the city proper this is now more than 25% of the total population if immigrant parents are included. As of 1 January 2016, the municipality of Oslo had a population of 658,390. The urban area extends beyond the boundaries of the municipality into the surrounding county of Akershus (municipalities of Asker, Bærum, Fet, Enebakk, Rælingen, Lørenskog, Nittedal, Skedsmo, Ski, Sørum, Gjerdrum, Oppegård); the total population of this agglomeration is 1,000,467. The city centre is situated at the end of the Oslofjord, from which point the city sprawls out in three distinct "corridors"—inland north-eastwards, and southwards along both sides of the fjord—which gives the urbanized area a shape reminiscent of an upside-down reclining "Y" (on maps, satellite pictures, or from high above the city). To the north and east, wide forested hills (Marka) rise above the city giving the location the shape of a giant amphitheatre. The urban municipality (bykommune) of Oslo and county [fylke] of Oslo are two parts of the same entity, making Oslo the only city in Norway where two administrative levels are integrated. Of Oslo's total area, 130 km2 (50 sq mi) is built-up and 7 km2 (2.7 sq mi) is agricultural. The open areas within the built-up zone amount to 22 km2 (8.5 sq mi). ^ The definition has since been revised in the 2015 census. After being destroyed by a fire in 1624, during the reign of King Christian IV, a new city was built closer to Akershus Fortress and named Christiania in the king's honour. The old site east of the Aker river was not abandoned however and the village of Oslo remained as a suburb outside the city gates. The suburb called Oslo was eventually included in the city proper. In 1925 the name of the suburb was transferred to the whole city, while the suburb was renamed "Gamlebyen" (literally "the Old town") to avoid confusion. The Old Town is an area within the administrative district Gamle Oslo. The previous names are reflected in street names like Oslo gate (Oslo street) and Oslo hospital. The origin of the name Oslo has been the subject of much debate. It is certainly derived from Old Norse and was — in all probability — originally the name of a large farm at Bjørvika, but the meaning of that name is disputed. Modern linguists generally interpret the original Óslo, Áslo or Ánslo as either "Meadow at the Foot of a Hill" or "Meadow Consecrated to the Gods", with both considered equally likely. Erroneously, it was once assumed that "Oslo" meant "the mouth of the Lo river", a supposed previous name for the river Alna. However, not only has no evidence been found of a river "Lo" predating the work where Peder Claussøn Friis first proposed this etymology, but the very name is ungrammatical in Norwegian: the correct form would have been Loaros (cf. Nidaros). The name Lo is now believed to be a back-formation arrived at by Friis in support of his [idea about] etymology for Oslo. CA. 1000 AD First traces of buildings. The St. Clement's Church is built. CA. 1050 AD Oslo marked as a city. Mariakirken is built. CA. 1300 Construction of Akershus Fortress starts. 1350 AD Around 3/4 of the population dies under the Black Death. 1624 AD Another major fire, the city is rebuilt and renamed Christiania by Christian IV. 1686 AD Fire ruins 1/4 of the city. 1716 AD The city and the fortress conquered by Karl XII. 1813 The University is opened. 1825 The foundations of Slottet are finished. 1836 The National Gallery is finished. 1837 Christiania Theatre is opened. Christiania and Aker get a Mayor and kommunestyre. 1854 Oslo gets its first railway, which leads to Eidsvoll. 1878 City expanded. Frogner, Majorstuen, Torshov, Kampen and Vålerengen are populated and rebuilt. 113 000 citizens. 1892 The first Holmenkollbakken is finished. 1894 The city gets its first electrical track. 1925 City renamed as Oslo. 1927 The Monolith is raised. 1928 Oslo first Metro line, Majorstuen-Besserud is opened. 1950 Oslo City Hall opened. 1963 The Munch Museum is opened. 1980 Metro line under the city, Oslo Central Station and Nationaltheatret Station opened. 1997 Population over 500 000. 1998 Rikshospitalet opened. New railway line to Gardermoen. 2000 The city celebrates thousand-years jubilee. 2008 Oslo Opera House is opened. 2011 Several buildings in the Regjeringskvartalet are heavily damaged during a terrorist attack, resulting in 8 deaths. 69 people are massacred on the nearby Utøya island. 2018 The city's urban area passed one million people for the first time. According to the Norse sagas, Oslo was founded around 1049 by Harald Hardrada. Recent archaeological research however has uncovered Christian burials which can be dated to prior to AD 1000, evidence of a preceding urban settlement. This called for the celebration of Oslo's millennium in 2000. It has been regarded as the capital city since the reign of Haakon V of Norway (1299–1319), the first king to reside permanently in the city. He also started the construction of the Akershus Fortress and the Oslo Kongsgård. A century later, Norway was the weaker part in a personal union with Denmark, and Oslo's role was reduced to that of provincial administrative centre, with the monarchs residing in Copenhagen. The fact that the University of Oslo was founded as late as 1811 had an adverse effect on the development of the nation. 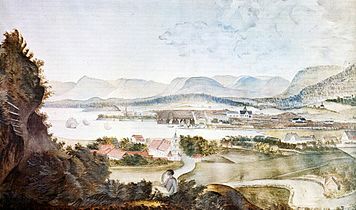 Oslo was destroyed several times by fire, and after the fourteenth calamity, in 1624, Christian IV of Denmark and Norway ordered it rebuilt at a new site across the bay, near Akershus Castle and given the name Christiania. Long before this, Christiania had started to establish its stature as a centre of commerce and culture in Norway. The part of the city built starting in 1624 is now often called Kvadraturen because of its orthogonal layout in regular, square blocks. The last Black Death outbreak in Oslo occurred in 1654. In 1814 Christiania once more became a real capital when the union with Denmark was dissolved. Many landmarks were built in the 19th century, including the Royal Palace (1825–1848), Storting building (the Parliament) (1861–1866), the University, National Theatre and the Stock Exchange. Among the world-famous artists who lived here during this period were Henrik Ibsen and Knut Hamsun (the latter was awarded the Nobel Prize for literature). In 1850, Christiania also overtook Bergen and became the most populous city in the country. In 1877 the city was renamed Kristiania. The original name of Oslo was restored in 1925. Under the reign of Olaf III of Norway, Oslo became a cultural centre for Eastern Norway. Hallvard Vebjørnsson became the city's patron saint and is depicted on the city's seal. In 1174, Hovedøya Abbey was built. The churches and abbeys became major owners of large tracts of land, which proved important for the city's economic development, especially before the Black Death. On 25 July 1197, Sverre of Norway and his soldiers attacked Oslo from Hovedøya. During the Middle Ages, Oslo reached its heights in the reign of Haakon V of Norway. He started building Akershus Fortress and was also the first king to reside permanently in the city, which helped to make Oslo the capital of Norway. In the end of the 12th century, Hanseatic League traders from Rostock moved into the city and gained major influence in the city. The Black Death came to Norway in 1349 and, like other cities in Europe, the city suffered greatly. The churches' earnings from their land also dropped so much that the Hanseatic traders dominated the city's foreign trade in the 15th century. Over the years, fire destroyed major parts of the city many times, as many of the city's buildings were built entirely of wood. After the last fire in 1624, which lasted for three days, Christian IV of Denmark decided that the old city should not be rebuilt again. His men built a network of roads in Akershagen near Akershus Castle. He demanded that all citizens should move their shops and workplaces to the newly built city Christiania, named as an honor to the king. The transformation of the city went slowly for the first hundred years. Outside the city, near Vaterland and Grønland near Old Town, Oslo, a new, unmanaged part of the city grew up filled with citizens of low class status. In 1814 the former provincial town of Christiania became the capital of the independent Kingdom of Norway, in a personal union with Sweden. Several state institutions were established and the city's role as a capital initiated a period of rapidly increasing population. The government of this new state needed buildings for its expanding administration and institutions. Several important buildings were erected – The Bank of Norway (1828), the Royal Palace (1848), and the Storting (1866). Large areas of the surrounding Aker municipality were incorporated in 1839, 1859 an 1878. The 1859 expansion included Grünerløkka, Grønland and Oslo. 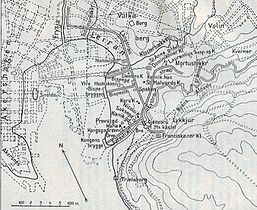 At that time the area called Oslo (now Gamlebyen or Old Town) was a village or suburb outside the city borders east of Aker river. The population increased from approximately 10 000 in 1814 to 230 000 in 1900. Christiania expanded its industry from 1840, most importantly around Akerselva. There was a spectacular building boom during the last decades of the 19th century, with many new apartment buildings and renewal of the city center, but the boom collapsed in 1899. The municipality developed new areas such as Ullevål garden city (1918–1926) and Torshov (1917–1925). City Hall was constructed in the former slum area of Vika, from 1931–1950. The municipality of Aker was incorporated into Oslo in 1948, and suburbs were developed, such as Lambertseter (from 1951). Aker Brygge was constructed on the site of the former shipyard Akers Mekaniske Verksted, from 1982–1998. The name of city and municipality was Kristiania until 1 January 1925 when the name was changed to Oslo. Oslo was the name of an eastern suburb and the site of the city centre until the devastating 1624 fire. Christian, king of Denmark, ordered a new city built with his own name. Oslo remained a poor suburb outside the city border. In the early 1900s it was argued that a Danish king was inappropriate as the name of the capital of independent Norway. Railway between Christiania and Bergen, 1916. Although Eastern Norway has a number of rivers, none of these flow into the ocean at Oslo. Instead Oslo has two smaller rivers: Akerselva (draining Maridalsvannet, which flows into the fjord in Bjørvika), and Alna. The waterfalls in Akerselva gave power to some of the first modern industry of Norway in the 1840s. Later in the century, the river became the symbol of the stable and consistent economic and social divide of the city into an East End and a West End; the labourers' neighbourhoods lie on both sides of the river, and the divide in reality follows Uelands street a bit further west. River Alna flows through Groruddalen, Oslo's major suburb and industrial area. The highest point is Kirkeberget, at 629 metres (2,064 ft). Although the city's population is small compared to most European capitals, it occupies an unusually large land area, of which two-thirds are protected areas of forests, hills and lakes. Its boundaries encompass many parks and open areas, giving it an airy and green appearance. Oslo has a humid continental climate (Köppen climate classification Dfb) with warm summers and cold winters. Due to oceanic influences, winters are less cold than more continental areas at same latitude. With -3°C isotherm, it is also reasonable for Oslo to be classified as a borderline oceanic climate. Oslo has a significant amount of rainfall during the year. This is true even for the driest month. Because of the city's northern latitude, daylight varies greatly, from more than 18 hours in midsummer, when it never gets completely dark at night (no darker than nautical twilight), to around 6 hours in midwinter. July 1901 was the warmest month ever recorded with 24-hr monthly mean temperature at 22.7 °C (72.9 °F). The climate table below is for 1981–2010, while extremes (except average annual maximum and minimum temperatures) also includes earlier stations such as the Observatory downtown. Recent decades have seen warming, and 8 of the 12 monthly record lows are from before 1900, while the most recent is the November record low from 1965. May 2018 saw hotter than average temperatures throughout the month. On 30 May 2018 the city saw temperatures rise to 31.1°C, making it the hottest May temperature on Oslo records. On 27th July 2018 the temperature in Oslo rose to 34.6 C, the hottest ever recorded since 1937, when the weather observations for Oslo have been conducted in the university area at Blindern. In January, three out of four days are below freezing (0 °C), on average one out of four days is colder than −10 °C. The coldest temperature recorded is −29.6 °C (−21.3 °F), on 21 January 1841, while the coldest ever recorded at Blindern is −26 °C (−14.8 °F) in January 1941. Frogner Park is a large park located a few minutes' walk away from the city centre. This is the biggest and best-known park in Norway, with a large collection of sculptures by Gustav Vigeland. Bygdøy is a large green area, commonly called the Museum Peninsula of Oslo. The area is surrounded by the sea and is one of the most expensive districts in Norway. Ekebergparken Sculpture Park is a sculpture park and a national heritage park with a panoramic view of the city at Ekeberg in the southeast of the city. St. Hanshaugen Park is an old public park on a high hill in central Oslo. "St. Hanshaugen" is also the name of the surrounding neighbourhood as well as the larger administrative district (borough) that includes major parts of central Oslo. Tøyen Park stretches out behind the Munch Museum, and is a vast, grassy expanse. In the north, there is a lookout point known as Ola Narr. The Tøyen area also includes the Botanical Garden and Museum belonging to the University of Oslo. Sognsvann is a lake in Oslomarka, located at the land border, just north of Oslo. Sognsvann was drinking water for Oslo from 1876 to 1967. The lake's altitude above sea level is 183 metres. The water is in a popular hiking area. Near the water itself, it is great for barbecues, swimming, beach volleyball and other activities. The municipality operates eight public swimming pools. Tøyenbadet is the largest indoor swimming facility in Oslo and one of the few pools in Norway offering a 50-metre main pool. Another in that size is the outdoor pool Frognerbadet. 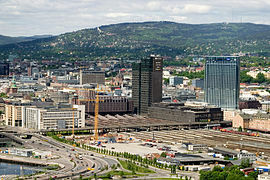 Oslo's cityscape is being redeveloped as a modern city with various access-points, an extensive metro-system with a new financial district and a cultural city. In 2008, an exhibition was held in London presenting the award-winning Oslo Opera House, the urban regeneration scheme of Oslo's seafront, Munch/Stenersen and the new Deichman Library. Most of the buildings in the city and in neighbouring communities are low in height with only the Plaza, Posthuset and the highrises at Bjørvika considerably taller. Oslo's architecture is very diverse. The architect Carl Frederik Stanley (1769–1805), who was educated in Copenhagen, spent some years in Norway around the turn of the 19th century. He did minor works for wealthy patrons in and around Oslo, but his major achievement was the renovation of the Oslo Katedralskole, completed in 1800. He added a classical portico to the front of an older structure, and a semicircular auditorium that was sequestered by Parliament in 1814 as a temporary place to assemble, now preserved at Norsk Folkemuseum as a national monument. Oslo is the capital of Norway, and as such is the seat of Norway's national government. Most government offices, including that of the Prime Minister, are gathered at Regjeringskvartalet, a cluster of buildings close to the national Parliament, the Storting. Constituting both a municipality and a county of Norway, the city of Oslo is represented in the Storting by nineteen members of parliament. The Conservative Party is the most represented party in Oslo with six members, the Labour Party has five, the Progress Party, the Liberals and the Socialist Left Party have two each ; the Green Party and the Red Party have one each. The combined municipality and county of Oslo has had a parliamentary system of government since 1986. The supreme authority of the city is the City Council (Bystyret), which currently has 59 seats. Representatives are popularly elected every four years. The City Council has five standing committees, each having its own areas of responsibility. The largest parties in the City Council after the 2015-elections are the Labour Party and the Conservatives, with 20 and 19 representatives respectively. The Mayor of Oslo is the head of the City Council and the highest ranking representative of the city. This used to be the most powerful political position in Oslo, but following the implementation of parliamentarism, the mayor has had more of a ceremonial role, similar to that of the President of the Storting at the national level. The current Mayor of Oslo is Marianne Borgen. Since the local elections of 2015, the city government has been a coalition of the Labour Party, the Green Party and the Socialist Left. Based mostly on support from the Red Party, the coalition maintains a workable majority in the City Council. The Governing Mayor of Oslo is the head of the City government. The post was created with the implementation of parliamentarism in Oslo and is similar to the role of the prime minister at the national level. The current governing mayor is Raymond Johansen. Oslo is an important centre of maritime knowledge in Europe and is home to approximately 1980 companies and 8,500 employees within the maritime sector. Some of them are the world's largest shipping companies, shipbrokers, and insurance brokers. Det Norske Veritas, headquartered at Høvik outside Oslo, is one of the three major maritime classification societies in the world, with 16.5% of the world fleet to class in its register. The city's port is the largest general cargo port in the country and its leading passenger gateway. Close to 6,000 ships dock at the Port of Oslo annually with a total of 6 million tonnes of cargo and over five million passengers. The GDP of Oslo totalled €64 billion(€96,000 per capita) in 2016, which amounted to 20% of the national GDP. This compares with NOK166 billion (US$17 billion) in 1995. The metropolitan area, bar Moss and Drammen, contributed 25% of the national GDP in 2003 and was also responsible for more than one quarter of tax revenues. In comparison, total tax revenues from the oil and gas industry on the Norwegian Continental Shelf amounted to about 16%. Oslo is one of the most expensive cities in the world. As of 2006, it is ranked tenth according to the Worldwide Cost of Living Survey provided by Mercer Human Resource Consulting and first according to the Economist Intelligence Unit. The reason for this discrepancy is that the EIU omits certain factors from its final index calculation, most notably housing. In the 2015 update of the EIU’s Worldwide Cost of Living survey, Oslo now ranks as the third most expensive city in the world. Although Oslo does have the most expensive housing market in Norway, it is comparably cheaper than other cities on the list in that regard. Meanwhile, prices on goods and services remain some of the highest of any city. Oslo hosts 2654 of the largest companies in Norway. Within the ranking of Europe's largest cities ordered by their number of companies Oslo is in fifth position. A whole group of oil and gas companies is situated in Oslo. According to a report compiled by Swiss bank UBS in the month of August 2006, Oslo and London were the world's most expensive cities. Oslo is a compact city. 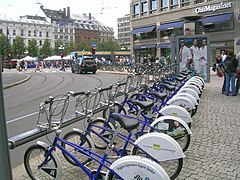 It is easy to move around by public transportation and rentable city bikes are accessible to all, all over the city centre. In 2003, Oslo received The European Sustainable City Award and in 2007 Reader's Digest ranked Oslo as number two on a list of the world's greenest, most liveable cities. Oslo has a large and varied number of cultural attractions, which include several buildings containing artwork from Edvard Munch and various other international artists but also several Norwegian artists. Several world-famous writers have either lived or been born in Oslo. Examples are Knut Hamsun and Henrik Ibsen. The government has recently invested large amounts of money in cultural installations, facilities, buildings and festivals in the City of Oslo. Bygdøy, outside the city centre is the centre for history and the Norwegian Vikings' history. The area contains a large number of parks and seasites and many museums. Examples are the Fram Museum, Vikingskiphuset and the Kon-Tiki Museum. 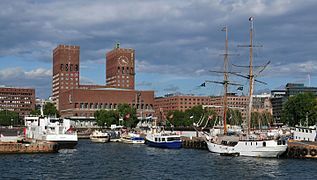 Oslo hosts the annual Oslo Freedom Forum, a conference described by The Economist as "on its way to becoming a human-rights equivalent of the Davos economic forum." Oslo is also known for giving out the Nobel Peace Prize every year. Grønland, the central areas around Youngstorget and Torggata, Karl Johans gate (the main pedestrian thoroughfare), Aker Brygge and Tjuvholmen, Sørenga, and the boroughs of Frogner, Majorstuen, St. Hanshaugen / Bislett, and Grünerløkka all have a high concentration of cafes and restaurants. There are several food markets, the largest being Mathallen Food Hall at Vulkan with more than 30 specialty shops, cafés, and eateries. As of March 2018 six Oslo restaurants were mentioned in the Michelin Guide. Maaemo is the only Norwegian restaurant ever to have been awarded three Michelin stars. Statholdergaarden, Kontrast, and Galt each have one star. Only two restaurants in Oslo have a BIB gourmand mention: Restaurant Eik and Smalhans. Oslo houses several major museums and galleries. The Munch Museum contains The Scream and other works by Edvard Munch, who donated all his work to the city after his death. The city council is currently planning a new Munch Museum which is most likely to be built in Bjørvika, in the southeast of the city. The museum will be named Munch/Stenersen. 50 different museums are located around the city. Folkemuseet is located on the Bygdøy peninsula and is dedicated to Folk art, Folk Dress, Sami culture and the viking culture. The outdoor museum contains 155 authentic old buildings from all parts of Norway, including a Stave Church. The Vigeland Museum located in the large Frogner Park, is free to access and contains over 212 sculptures by Gustav Vigeland including an obelisk and the Wheel of Life. Another popular sculpture is Sinnataggen, a baby boy stamping his foot in fury. This statue is very well known as an icon in the city. There is also a newer landscaped sculpture park, Ekebergparken Sculpture Park, with works by Norwegian and international artists such as Salvador Dalí. The Viking Ship Museum features three Viking ships found at Oseberg, Gokstad and Tune and several other unique items from the Viking age. The Oslo City Museum holds a permanent exhibition about the people in Oslo and the history of the city. The Kon-Tiki Museum houses Thor Heyerdahl's Kontiki and Ra2. The National Museum holds and preserves, exhibits and promotes public knowledge about Norway's most extensive collection of art. The Museum shows permanent exhibitions of works from its own collections but also temporary exhibitions that incorporate work loaned from elsewhere. The National Museums exhibition avenues are the National Gallery, the Museum of Contemporary Art, the National Museum, the Museum of Decorative Arts and the National Museum of Architecture. A new National Museum in Oslo will open in 2020 located at Vestbanen behind the Nobel Peace Center. The Nobel Peace Center is an independent organisation opened on 11 June 2005 by the King Harald V as part of the celebrations to mark Norway's centenary as an independent country. The building houses a permanent exhibition, expanding every year when a new Nobel Peace Prize winner is announced, containing information of every winner in history. The building is mainly used as a communication centre. A large number of festivals are held in Oslo, such as Oslo Jazz festival, a six-day jazz festival which has been held annually in August for the past 25 years. Oslo's biggest rock festival is Øyafestivalen or simply "Øya". It draws about 60,000 people to the Tøyen Park east in Oslo and lasts for four days. Oslo has hosted the Eurovision Song Contest twice, in 1996 and 2010. In recent years, novelists like Lars Saabye Christensen, Tove Nilsen, Jo Nesbø and Roy Jacobsen have described the city and its people in their novels. Early 20th-century literature from Oslo include poets Rudolf Nilsen and André Bjerke. The newspapers Aftenposten, Dagbladet, Verdens Gang, Dagens Næringsliv, Finansavisen, Dagsavisen, Morgenbladet, Vårt Land, Nationen and Klassekampen are published in Oslo. The main office of the national broadcasting company NRK is located at Marienlyst in Oslo, near Majorstuen, and NRK also has regional services via both radio and television. TVNorge (TVNorway) is also located in Oslo, while TV 2 (based in Bergen) and TV3 (based in London) operate branch offices in central Oslo. There is also a variety of specialty publications and smaller media companies. A number of magazines are produced in Oslo. The two dominant companies are Aller Media and Hjemmet Mortensen AB. Bislett Stadium during a friendly between Lyn Oslo and Liverpool F.C. Oslo is home to the Holmenkollen National Arena and Holmenkollbakken, the country's main biathlon and Nordic skiing venues. It hosts annual world cup tournaments, including the Holmenkollen Ski Festival. Oslo hosted the Biathlon World Championships in 1986, 1990, 2000, 2002 and 2016. FIS Nordic World Ski Championships have been hosted in 1930, 1966, 1982 and 2011, as well as the 1952 Winter Olympics. Oslo is the home of several football clubs in the Norwegian league system. Vålerenga, Lyn and Skeid have won both the league and the cup, while Mercantile and Frigg have won the cup. Ullevål Stadion is the home arena for the Norwegian national football team and the Football Cup Final. The stadium has previously hosted the finals of the UEFA Women's Championship in 1987 and 1997, and the 2002 UEFA European Under-19 Football Championship. Røa IL is Oslo's only team in the women's league, Toppserien. Each year, the international youth football tournament Norway Cup is held on Ekebergsletta and other places in the city. Due to the cold climate and proximity to major forests bordering the city, skiing is a popular recreational activity in Oslo. The Tryvann Ski Resort is the most used ski resort in Norway. The most successful ice hockey team in Norway, Vålerenga Ishockey, is based in Oslo. Manglerud Star is another Oslo-team who play in the top league. Bislett Stadium is the city's main track and field venue, and hosts the annual Bislett Games, part of IAAF Diamond League. Bjerke Travbane is the main venue for harness racing in the country. Oslo Spektrum is used for large ice hockey and handball matches. Nordstrand HE and Oppsal IF plays in the women's GRUNDIGligaen in handball, while Bækkelaget HE plays in the men's league. Jordal Amfi, the home of the ice hockey team Vålerenga Ishockey, and the national team. The 1999 IIHF World Championship in ice hockey were held in Oslo, as have three Bandy World Championships, in 1961, 1977 and 1985. The UCI Road World Championships in bicycle road racing were hosted 1993. Oslo was bidding to host the 2022 Winter Olympics, but later withdrew on 2 October 2014. In 2018 Oslo is named one of Lonely Planet's Top Ten Cities. The travel guide's best-selling yearbook Best in Travel has selected Oslo as one of the ten best cities in the world to visit in 2018, citing the Norwegian capital's "innovative architecture and unmissable museums alongside cool bars, bistros and cafés". Oslo Police District is Norway's largest police district with over 2,300 employees. Over 1,700 of those are police officers, nearly 140 police lawyers and 500 civilian employees. Oslo Police District has five police stations located around the city at Grønland, Sentrum, Stovner, Majorstuen and Manglerud. The National Criminal Investigation Service is located in Oslo, which is a Norwegian special police division under the NMJP. PST is also located in the Oslo District. PST is a security agency which was established in 1936 and is one of the non-secret agencies in Norway. Oslo police stated that the capital is one of Europe's safest. Statistics have shown that crime in Oslo is on the rise, and some media have reported that there are four times as many thefts and robberies in Oslo than in New York City per capita. According to the Oslo Police, they receive more than 15,000 reports of petty thefts annually. Fewer than one in a hundred cases get solved. Oslo has Norway's most extensive public transport system, managed by Ruter. This includes the six-line Oslo Metro, the world's most extensive metro per resident, the six-line Oslo Tramway and the eight-line Oslo Commuter Rail. The tramway operates within the areas close to the city centre, while the metro, which runs underground through the city centre, operates to suburbs further away; this includes two lines that operate to Bærum, and the Ring Line which loops to areas north of the centre. 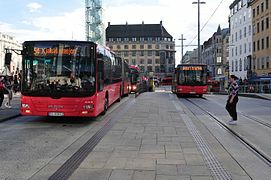 Oslo is also covered by a bus network consisting of 32 city lines, as well as regional buses to the neighboring county of Akershus. Many of the motorways pass through the downtown and other parts of the city in tunnels. The construction of the roads is partially supported through a toll ring. The major motorways through Oslo are European Route E6 and E18. There are three beltways, the innermost which are streets and the outermost, Ring 3 which is an expressway. The main airport serving the city is Gardermoen Airport, located in Ullensaker, 47 kilometres (29 mi) from the city centre of Oslo. It acts as the main international gateway to Norway, and is the sixth-largest domestic airport in Europe. Gardermoen is a hub for Scandinavian Airlines, Norwegian Air Shuttle and Widerøe. Oslo is also served by a secondary airport, which serve some low-cost carriers, such as Ryanair: Torp Airport, 110 kilometres (68 mi) from the city. The population of Oslo was by 2010 increasing at a record rate of nearly 2% annually (17% over the last 15 years), making it the fastest-growing Scandinavian capital. In 2015, according to Statistics Norway annual report, there were 647,676 permanent residents in the Oslo municipality, of which 628,719 resided in the city proper. There were also 1,000,467 in the city's urban area and an estimated 1.71 million in the Greater Oslo Region, within 100 km (62 mi) of the city centre. According to the most recent census 432,000 Oslo residents (70.4% of the population) were ethnically Norwegian, an increase of 6% since 2002 (409,000). Oslo has the largest population of immigrants and Norwegians born to immigrant parents in Norway, both in relative and absolute figures. Of Oslo's 624,000 inhabitants, 189,400 were immigrants or born to immigrant parents, representing 30.4 percent of the capital's population. All suburbs in Oslo were above the national average of 14.1 percent. The suburbs with the highest proportions of people of immigrant origin were Søndre Nordstrand, Stovner and Alna, where they formed around 50 percent of the population. Pakistanis make up the single largest ethnic minority, followed by Poles, Somalis, and Swedes. Other large immigrant groups are people from Sri Lanka, Vietnam, Turkey, Morocco, Iraq & Kurdistan region and Iran & Kordestan province. In 2013, 40% of Oslo's primary school pupils were registered as having a first language other than Norwegian or Sami. The western part of the city is predominantly ethnic Norwegian, with several schools having less than 5% pupils with an immigrant background. The eastern part of Oslo is more mixed, with some schools up to 97% of immigrant background. Schools are also increasingly divided by ethnicity, with white flight being present in some of the northeastern suburbs of the city. In the borough of Groruddalen in 2008 for instance, the ethnic Norwegian population decreased by 1,500, while the immigrant population increased by 1,600. Oslo has numerous religious communities. In 2017, 50.0% of the population were members of the Church of Norway, lower than the national average of 70.6%. Members of other Christian denominations make up 8.1% of the population. Islam was followed by 8.7% and Buddhism by 0.5% of the population. Adherents of other religions formed 0.9% of the population. Life stance communities, mainly the Norwegian Humanist Association, were represented by 2.9% of the population. 28.9% of the Oslo population were unaffiliated with any religion or life stance community. Oslo is a pilot city of the Council of Europe and the European Commission's Intercultural cities programme, along with a number of other European cities. Oslo was formerly twinned with Madison, Wisconsin, Tel Aviv and Vilnius, but has since abolished the concept of twin cities. Oslo has a tradition of sending a Christmas tree every year to the cities of Washington, D.C.; New York; London; Edinburgh; Rotterdam; Antwerp and Reykjavík. Since 1947, Oslo has sent a 65-to-80-foot-high (20-to-24-metre), 50 to 100-year-old spruce, as an expression of gratitude toward Britain for its support of Norway during World War II. ^ "Arealstatistikk for Norge". Kartverket.no. Kartverket. 16 October 2014. Archived from the original on 19 April 2016. Retrieved 13 October 2015. ^ a b "Population, 1 January 2016". Statistics Norway. 19 February 2016. Retrieved 28 March 2016. ^ a b "Population and land area in urban settlements, 1 January 2014". Statistics Norway. 9 April 2015. Retrieved 6 September 2015. ^ a b "Population and population changes, Q2 2015". Statistics Norway. 20 August 2015. Retrieved 13 October 2015. ^ regionaldepartementet, Kommunal- og (9 May 2003). "St.meld. nr. 31 (2002-2003)". Regjeringen.no (in Norwegian). Retrieved 22 December 2017. ^ "Folketalet ved nyttår var 5 258 000". ssb.no (in Norwegian Nynorsk). Retrieved 22 December 2017. ^ "Finn postnummer og adresser i Norge og utlandet". ^ "Oslo". The American Heritage Dictionary of the English Language (5th ed.). Boston: Houghton Mifflin Harcourt. 2014. Retrieved 22 April 2019. ^ "Oslo". Collins English Dictionary. HarperCollins. Retrieved 22 April 2019. ^ "GaWC – The World According to GaWC 2008". Lboro.ac.uk. 13 April 2010. Retrieved 23 July 2011. ^ a b Rachel Craig (13 February 2012). "European Cities and Regions of the Future 2012/13". fDiIntelligence.com. Retrieved 12 March 2013. ^ "Sydney rockets up the list of the world's most expensive cities". ECA International. 8 June 2011. Archived from the original on 3 October 2011. Retrieved 10 July 2011. ^ a b c Pål Vegard Hagesæther (2 December 2018). "Nå bor det over én million i Stor-Oslo". Aftenposten. Retrieved 11 December 2018. ^ a b "Demografi innenfor ti mil fra Oslo. 1. januar 2010 og endringer 2000–2009. Antall og prosent" [Demographics within a hundred kilometers from Oslo. 1 January 2010 and changes 2000–2009. Number and percent]. Statistics Norway (in Norwegian). Retrieved 15 January 2016. ^ "Oslo europamester i vekst – Nyheter – Oslo". Aftenposten.no. Archived from the original on 1 May 2011. Retrieved 3 June 2011. ^ "Ola og Kari flytter fra innvandrerne – Nyheter – Oslo". Aftenposten.no. Archived from the original on 4 June 2011. Retrieved 3 June 2011. ^ "Immigration and immigrants". Ssb.no. 1 January 2009. Archived from the original on 2 September 2009. Retrieved 29 August 2009. ^ a b c "Population, 1 January 2015". Statistics Norway. 19 February 2015. Archived from the original on 24 September 2015. Retrieved 13 October 2015. ^ "Bydeler" [Districts]. Oslo Kommune (in Norwegian). Retrieved 6 September 2015. ^ Aftenposten, 12 October 2014, p. 15. ^ Han har kartlagt Christianias karthistorie, Osloby, 8 December 2014. ^ Knut Are Tvedt, red. (2000). «Oslo gate». Oslo byleksikon (4. utg.). Oslo: Kunnskapsforlaget. page. 324. ISBN 82-573-0815-3. ^ Pål Abrahamsen et al. (red. ): Fra dollhus til moderne psykiatri. Oslo Hospital 1538 – 1988. Selskapet for Oslo bys vel. Oslo 1988. ^ cf. Bjorvand, Harald (2008): "Oslo." I: Namn och bygd 2008; volume 96. ^ Jørgensen, Jon G. "Peder Claussøn Friis". In Helle, Knut (ed.). Store norske leksikon (in Norwegian). Oslo: Kunnskapsforlaget. ^ Alna – elv i Oslo, Store Norske Leksikon (in Norwegian). ^ Heraldry of the World (2010). 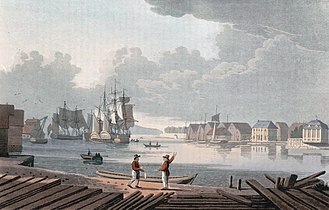 "Oslo byvåpen". ngw.nl. Archived from the original on 28 July 2011. Retrieved 5 July 2011. ^ "Inside Oslo : Inside". TripAdvisor. Retrieved 25 March 2010. ^ Oslo byleksikon. Oslo: Kunnskapsforl. 2000. ISBN 9788257308155. ^ Øivind Larsen. "DNMS.NO : Michael: 2005 : 03/2005 : Book review: Black Death and hard facts". Norwegian Medical Society. Retrieved 11 March 2014. ^ Bård Alsvik. "Oslo kommune byarkivet (Oslo City Archives)". Oslo Kommune. Retrieved 23 September 2013. ^ Leif Gjerland (25 July 2014). "Kongen som angrep Oslo fra Hovedøya". Aftenposten. ^ Boye, Else: Christiania 1814-1905. Oslo: Grøndahl, 1976. ^ NRK. "Da Oslo ble Oslo". NRK (in Norwegian Bokmål). Retrieved 5 May 2018. ^ "Climate Oslo: Temperature, Climograph, Climate table for Oslo - Climate-Data.org". en.climate-data.org. Retrieved 20 June 2018. ^ "Det har aldri noensinne blitt målt høyere temperatur i Norge i mai". Dagbladet.no (in Norwegian). 30 May 2018. Retrieved 13 August 2018. ^ "Oslo and Bergen set heat records - Norway Today". Norway Today. 31 May 2018. Retrieved 13 August 2018. ^ "Blindern (Oslo)". Norwegian Meteorological Institute. Archived from the original on 15 December 2010. Retrieved 10 January 2016. ^ "Climate Normals for Norway 1981-2010" (in French). Météo Climat. Retrieved 15 October 2018. ^ "Weather extremes for Oslo Blindern" (in French). Météo Climat. Retrieved 15 October 2018. ^ "Municipal swimming pools". Idrettsetaten.oslo.kommune.no. 16 June 2010. Retrieved 27 June 2010. ^ "Oslo's developing waterfront, in a photo collage". ^ "OSLO TOURIST GUIDE — A hive of Art & Architecture". OSLO TOURIST GUIDE. Retrieved 9 April 2019. ^ "Norwegian Tax Administration Annual Report 2003" (PDF). Archived from the original (PDF) on 18 March 2009. Retrieved 8 July 2009. ^ a b "Oslo 'priciest city in the world'". BBC News. 1 February 2006. Retrieved 21 June 2010. ^ "Mercer: Consulting. Outsourcing. Investments". Mercerhr.com. Archived from the original on 16 May 2008. Retrieved 10 June 2009. ^ EIU digital solutions. "Worldwide Cost of Living February 2015 – The Economist Intelligence Unit". ^ "These are the world's most expensive cities". CNBC. 2 March 2015. Retrieved 12 March 2015. ^ polymorphing. "Sustainable Cities And Towns Campaign". Sustainable-cities.eu. Archived from the original on 1 May 2011. Retrieved 21 June 2010. ^ Kahn, Matthew. "Living Green: Ranking the best (and worst) countries". Reader's Digest Australia. Archived from the original on 20 December 2010. Retrieved 21 June 2010. ^ "Norges idrettshøgskole — forskning og høyere utdanning innenfor idrettsvitenskap — NIH". Nih.no. Retrieved 10 June 2009. ^ "Kunsthøgskolen i Oslo". Khio.no. 1 August 2000. Retrieved 10 June 2009. ^ "Universitetet for miljø- og biovitenskap — UMB". Umb.no. Retrieved 10 June 2009. ^ "Internett – Norges veterinærhøgskole". Veths.no. Retrieved 10 June 2009. ^ "Ska-Wiki – Ska-Wiki". ska-wiki.no. Archived from the original on 10 October 2007. ^ "UiO i tall". uio.no. Retrieved 22 March 2012. ^ "A crowded field". The Economist. 27 May 2010. ^ "Oslo: The City of Art, Fountains, Flowers, and Sculptures". vezit.com. Retrieved 27 July 2017. ^ "Edvard Munch» Edvard Munch Biography 3". Edvardmunch.info. Archived from the original on 1 May 2011. Retrieved 3 June 2011. ^ Tone:. "Attractions: Museums and sights of Oslo, Norway". Visitoslo.com. Retrieved 3 June 2011. ^ "Oslo Museums". World66.com. 18 March 2005. Archived from the original on 1 May 2011. Retrieved 3 June 2011. ^ "Frognerparken and Vigeland Park – Oslo". Cosmotourist. Retrieved 3 June 2011. ^ "Sinnataggen". Oslosurf.com. Retrieved 3 June 2011. ^ Norway dot com. "The Viking Ship Museum (Vikingskipshuset), Museums, Oslo Norway Directory". Norway.com. Archived from the original on 27 May 2011. Retrieved 3 June 2011. ^ Norway dot com. "Oslo City Museum, Museums, Oslo Norway Directory". Norway.com. Archived from the original on 1 May 2011. Retrieved 3 June 2011. ^ "The Kon-Tiki Museum – Norway official travel guide". visitnorway.com. Retrieved 3 June 2011. ^ a b c "About the National Museum : Nasjonalmuseet". Nasjonalmuseet.no. Archived from the original on 15 May 2011. Retrieved 3 June 2011. ^ "The National Museum at Vestbanen : Nasjonalmuseet". Nasjonalmuseet.no. Archived from the original on 15 May 2011. Retrieved 3 June 2011. ^ a b "Nobel Peace Center Opens in Oslo". Norway.org. Archived from the original on 8 June 2011. Retrieved 3 June 2011. ^ OJF (2011). "Oslo Jazzfestival". oslojazz.no. Archived from the original on 1 July 2011. Retrieved 5 July 2011. ^ "Oslo Internasjonale kirkemusikkfestival". Kirkemusikkfestivalen.no. Archived from the original on 17 May 2013. Retrieved 12 March 2013. ^ NobelPrize.Org (2011). "The Nobel Peace Prize Award Ceremony 2010". nobelprize.org. Retrieved 5 July 2011. ^ VisitOslo.Com (2011). "World Cup Biathlon – Official Travel & Visitor's Guide to Oslo, Norway". visitoslo.com. Archived from the original on 17 September 2011. Retrieved 5 July 2011. ^ Desu.No (2011). "Desu". desu.no (in Norwegian). Archived from the original on 3 August 2011. Retrieved 5 July 2011. ^ KNS.No (2011). "Fokus Bank Færderseilasen – KNS". kns.no. Archived from the original on 6 July 2011. Retrieved 5 July 2011. ^ Oslo-Filharmonien (2011). "Filharmonien". oslofilharmonien.no. Archived from the original on 14 August 2011. Retrieved 5 July 2011. 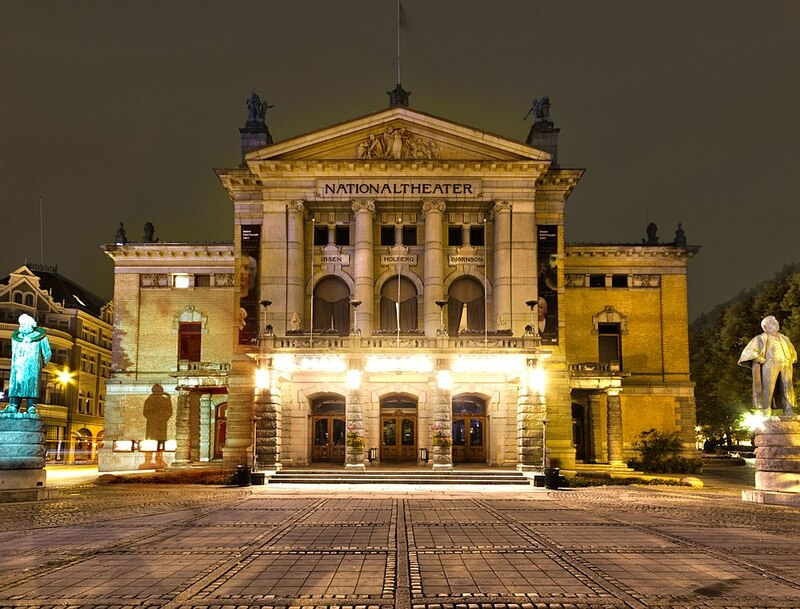 ^ a b "Nationaltheatret – National Theatre: Photos and videos on Google Maps, the WIKI-way". 59.914386,10.7342595: Wiki.worldflicks.org. Retrieved 3 June 2011. ^ "7 of the Best Tourist Attractions in Oslo, Norway". Globe Tales. Archived from the original on 1 May 2011. Retrieved 3 June 2011. ^ Økland, Ingunn (10 September 2008). "Ibsen som jålete graffiti". Aftenposten (in Norwegian). Archived from the original on 4 May 2011. ^ Ullevaal Stadion. "Historikk" (in Norwegian). Retrieved 10 June 2009. ^ Tvedt, Knut Are, ed. (2010). "Tryvann Vinterpark". Oslo byleksikon (in Norwegian) (5th ed.). Oslo: Kunnskapsforlaget. p. 582. ISBN 978-82-573-1760-7. ^ Redaksjon (7 March 2008). "Fire ganger mer krim i Oslo enn i New York". Osloby.no (in Norwegian). Retrieved 28 August 2012. ^ Oslo, Politidistrikt. "Kriminaliteten i Oslo". Politi.no (in Norwegian). Archived from the original on 15 October 2013. Retrieved 25 August 2012. ^ Norsk Telegrambyrå (9 October 2012). "Oslo har like mange lommetyverier som Berlin". Vg.no (in Norwegian). Retrieved 9 October 2012. ^ "7 Dead in Oslo Explosion; 80 Killed in Shooting at Camp". PBS. Archived from the original on 22 July 2011. Retrieved 23 July 2011. ^ "Om Ruter" (in Norwegian). Ruter. Archived from the original on 7 March 2010. Retrieved 1 December 2010. ^ "T-banen – forstadsbane og storbymetro" (in Norwegian). Ruter. Archived from the original on 6 December 2010. Retrieved 1 December 2010. ^ "Trikk" (in Norwegian). Ruter. Archived from the original on 6 December 2010. Retrieved 1 December 2010. ^ "Network map commuter trains" (PDF) (in Norwegian). Norwegian State Railways. Archived from the original (PDF) on 29 October 2013. Retrieved 1 December 2010. ^ "T-baneringen" (in Norwegian). Oslo Package 2. Archived from the original on 1 May 2011. Retrieved 1 December 2010. ^ "City Bus Network Map" (PDF). 2013. Archived from the original (PDF) on 24 January 2013. ^ "Oslo S bygges om for 2.9 milliarder kroner" (in Norwegian). Rom Eiendom. Retrieved 19 December 2009. ^ "Network map" (PDF) (in Norwegian). Norwegian State Railways. Archived from the original (PDF) on 27 August 2010. Retrieved 1 December 2010. ^ Holøs, Bjørn (1990). Stasjoner i sentrum (in Norwegian). Oslo: Gyldendal Norsk Forlagg. p. 182. ISBN 82-05-19082-8. ^ "Båt til jobb og skole, eller bad og utflukt" (in Norwegian). Ruter. Archived from the original on 11 December 2010. Retrieved 1 December 2010. ^ "Passasjer/turist" (in Norwegian). Port of Oslo. Archived from the original on 1 May 2011. Retrieved 1 December 2010. ^ "Administration". Oslo Lufthavn. Archived from the original on 24 January 2010. Retrieved 19 January 2010. ^ "Market". Oslo Lufthavn. Archived from the original on 24 November 2009. Retrieved 19 January 2010. ^ "Economic crisis stops air transport growth" (PDF). Eurostat. Archived from the original (PDF) on 30 September 2010. Retrieved 18 January 2010. ^ Sandefjord Lufthavn. "How do I get to Sandefjord Airport Torp?". Archived from the original on 16 March 2009. Retrieved 24 October 2009. ^ "Projected population – Statistics Norway". Statbank.ssb.no. Archived from the original on 26 May 2012. Retrieved 23 July 2011. ^ "Immigrants and Norwegian-born to immigrant parents, by immigration category, country background and percentages of the population". ssb.no. Retrieved 26 June 2017. ^ Ole Kristian Nordengen Hanne Waaler Lier Pål V. Hagesæther. "Om 15 år kan det bo 100 000 flere i Oslo". Aftenposten.no. Archived from the original on 4 May 2011. Retrieved 27 June 2010. ^ "Polakker den største innvandrergruppen" (in Norwegian). Ssb.no. Retrieved 27 June 2010. ^ "Tabell 11 Innvandrere og norskfødte med innvandrerforeldre, etter landbakgrunn (de 20 største gruppene). Utvalgte kommuner. 1. januar 2009" (in Norwegian). Ssb.no. Archived from the original on 28 June 2011. Retrieved 22 January 2010. ^ Oslo kommune, Undervisningsetaten (4 January 2013). "Minoritetsspråklige elever i Osloskolen 2012/2013" (PDF). Undervisningsetaten. ^ Bredeveien, Jo Moen (2 June 2009). "Rømmer til hvitere skoler". Dagsavisen. Archived from the original on 8 December 2009. ^ Lundgaard, Hilde (22 August 2009). "Foreldre flytter barna til "hvitere" skoler". Aftenposten. Archived from the original on 26 August 2009. ^ Slettholm, Andreas (15 December 2009). "Ola og Kari flytter fra innvandrerne". Aftenposten. Archived from the original on 4 June 2011. ^ a b "Medlemmer i tros- og livssynssamfunn som mottar offentlig støtte" (in Norwegian). Oslo kommune Statistikkbanken. Retrieved 9 June 2018. ^ a b "Folkemengden etter kjønn og alder (B) (2004–2018)" (in Norwegian). Oslo kommune Statistikkbanken. Retrieved 9 June 2018. ^ Haverkamp, Frode; Gude, Hans Fredrik (January 1992). Hans Gude (in Norwegian). Oslo: Aschehoug. p. 59. ISBN 82-03-17072-2. OCLC 29047091. ^ Council of Europe (2011). "Intercultural city: Oslo, Norway". coe.int. Retrieved 22 May 2011. ^ Wood, Phil (2009). "Intercultural Cities" (PDF). Council of Europe. Retrieved 10 January 2016. ^ "Co-operating cities and regions". Oslo.kommune.no. Oslo Kommune. 12 February 2012. Archived from the original on 7 April 2014. Retrieved 6 April 2014. ^ Juletrær til utland Ordføreren, Oslo kommune (Municipality of Oslo Website, Mare's office), published november 2013, accessed 7 April 2014. ^ Her tennes juletreet i London, VG, 3 December 2009. ^ Ina Louise Stovner. "juletre". Store norske leksikon. Retrieved 12 February 2016. "Christiania" . The American Cyclopædia. 1879. The 1952 Winter Olympics (Norwegian: Vinter-OL 1952), officially known as the VI Olympic Winter Games (French: Les VIes Jeux olympiques d'hiver), took place in Oslo, Norway, from 14 to 25 February 1952. Discussions about Oslo hosting the Winter Olympic Games began as early as 1935; the city wanted to host the 1948 Games, but World War II made that impossible. Instead, Oslo won the right to host the 1952 Games in a contest that included Cortina d'Ampezzo in Italy and Lake Placid in the United States. All of the venues were in Oslo's metropolitan area except for the alpine skiing events, which were held at Norefjell, 113 km (70 mi) from the capital. A new hotel was built for the press and dignitaries, along with three dormitories to house athletes and coaches, creating the first modern athlete's village. The city of Oslo bore the financial burden of hosting the Games in return for the revenue they generated. attacks by Anders Behring Breivik against the government, the civilian population, and a Workers' Youth League (AUF) summer camp, in which 77 people were killed. The first attack was a car bomb explosion in Oslo within Regjeringskvartalet, the executive government quarter of Norway, at 15:25:22 (CEST). The bomb was placed inside of a van next to the tower block housing the office of the Prime Minister Jens Stoltenberg. The explosion killed eight people and injured at least 209 people, twelve severely.The second attack occurred less than two hours later at a summer camp on the island of Utøya in Tyrifjorden, Buskerud. The camp was organized by the AUF, the youth division of the ruling Norwegian Labour Party (AP). Breivik, dressed in a homemade police uniform and showing false identification, took a ferry to the island and opened fire at the participants, killing 69 and injuring at least 110, 55 seriously. Among the dead were friends of Prime Minister Jens Stoltenberg, and the stepbrother of Norway's crown princess Mette-Marit.The attack was the deadliest in Norway since World War II. A survey found that one in four Norwegians knew someone affected. The European Union, NATO and several countries expressed their support for Norway and condemned the attacks. The 2012 Gjørv Report concluded that Norway's police could have prevented the bombing and caught Breivik faster at Utøya, and that measures to prevent further attacks and "mitigate adverse effects" should have been implemented.The Norwegian Police arrested Anders Behring Breivik, a 32-year-old Norwegian right-wing extremist, on Utøya island and charged him with both attacks. His trial took place between 16 April and 22 June 2012 in Oslo District Court, where Breivik admitted carrying out the attacks, but denied criminal guilt and claimed the defense of necessity (jus necessitatis). On 24 August, Breivik was convicted as charged and sentenced to 21 years of preventive detention in prison, the maximum sentence allowed in Norway. The sentence can be extended indefinitely as long as the prisoner is deemed a threat to society. Akershus [²ɑːkəʂˌhʉːs] (listen) is a county in Norway, bordering Hedmark, Oppland, Buskerud, Oslo, and Østfold; it also has a short border with Sweden (Värmland). Akershus, with a little over 614,000 inhabitants, is the second most populated county by population after Oslo. 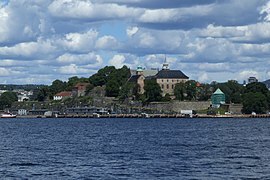 The county is named after Akershus Fortress. The county administration is in Oslo, which is not part of the county per se. Anders Behring Breivik (Norwegian pronunciation: [ˈɑnːəʂ ˈbeːrɪŋ ˈbræɪviːk] (listen); born 13 February 1979), since 2017 legally Fjotolf Hansen and also known by his pseudonym Andrew Berwick, is a Norwegian far-right terrorist who committed the 2011 Norway attacks. On 22 July 2011, he killed eight people by detonating a van bomb amid Regjeringskvartalet in Oslo, then shot dead 69 participants of a Workers' Youth League (AUF) summer camp on the island of Utøya. In July 2012, he was convicted of mass murder, causing a fatal explosion, and terrorism.Breivik was arrested as a juvenile and rejected from the Norwegian Armed Forces. At the age of 20 he joined the anti-immigration/right-wing Progress Party, and chaired the local Vest Oslo branch of the party's youth organization during 2002. He left the Progress Party in 2006 and went on to join a gun club and the Freemasons while also founding a company which he used to finance his planned terrorist attacks. On the day of the attacks, Breivik electronically distributed a compendium of texts entitled 2083: A European Declaration of Independence, describing his militant ideology. In them, he stated his opposition to Islam and blamed feminism for a European "cultural suicide." The text called for the deportation of all Muslims from Europe and Breivik wrote that his main motive for the attacks was to publicize his manifesto.Two teams of court-appointed forensic psychiatrists examined Breivik before his trial. The first team diagnosed Breivik with paranoid schizophrenia but after this initial finding was criticized, a second evaluation concluded that he was not psychotic during the attacks but did have narcissistic personality disorder.His trial began on 16 April 2012, with closing arguments made on 22 June 2012. On 24 August 2012, Oslo District Court delivered its verdict, finding Breivik sane and guilty of murdering 77 people. He was sentenced to 21 years in prison, in a form of preventive detention that required a minimum of 10 years incarceration and the possibility of one or more extensions for as long as he is deemed a danger to society. This is the maximum penalty in Norway. Breivik announced that he did not recognize the legitimacy of the court and therefore did not accept its decision—he claimed he "cannot" appeal because this would legitimize the authority of the Oslo District Court. In 2016, Breivik sued the Norwegian Correctional Service, claiming that his solitary confinement violated his human rights. Subsequent court ruling found that his rights had not been violated, despite an earlier ruling, and in June 2017, Breivik filed a complaint with the European Court of Human Rights (ECtHR), which dismissed his case in June 2018.Since his imprisonment, Breivik has identified himself as a fascist and a Nazi, who practices Odinism and uses counterjihadist rhetoric to support ethno-nationalists. Edvard Munch (; Norwegian: [ˈɛdvɑʈ ˈmʊŋk] (listen); 12 December 1863 – 23 January 1944) was a Norwegian painter, whose best known work, The Scream, has become one of the most iconic images of world art. His childhood was overshadowed by illness, bereavement and the dread of inheriting a mental condition that ran in the family. Studying at the Royal School of Art and Design in Kristiania (today’s Oslo), Munch began to live a bohemian life under the influence of nihilist Hans Jæger, who urged him to paint his own emotional and psychological state ('soul painting'). From this would presently emerge his distinctive style. Travel brought new influences and new outlets. In Paris, he learned much from Paul Gauguin, Vincent van Gogh and Henri de Toulouse-Lautrec, especially their use of colour. In Berlin, he met Swedish dramatist August Strindberg, whom he painted, as he embarked on his major canon The Frieze of Life, depicting a series of deeply-felt themes such as love, anxiety, jealousy and betrayal, steeped in atmosphere. But it was back in Kristiania that his legendary work The Scream was conceived. According to Munch, he was out walking at sunset, when he ‘heard the enormous, infinite scream of nature’. That agonised face is widely identified with the angst of modern man. Between 1893 and 1910, he made two painted versions and two in pastels, as well as a number of prints. One of the pastels would eventually command the fourth highest nominal price paid for a painting at auction. As his fame and wealth grew, his emotional state remained as insecure as ever. He briefly considered marriage, but could not commit himself. A breakdown in 1908 forced him to give up heavy drinking, and he was cheered by his increasing acceptance by the people of Kristiania and exposure in the city’s museums. His later years were spent working in peace and privacy. Although his works were banned in Nazi Germany, most of them survived World War II, ensuring him a secure legacy. The Eurovision Song Contest 2010 was the 55th edition of the annual Eurovision Song Contest. It took place in Oslo, Norway, following Alexander Rybak's win at the 2009 contest in Moscow, Russia with the song "Fairytale". It was the third time Norway had hosted the contest, having previously done so in 1986 and 1996. The contest was broadcast from the Telenor Arena in Bærum, Greater Oslo, Norway. The 2010 winner was Germany with Lena singing "Satellite", written by American Julie Frost and Denmark's John Gordon. It was Germany's first win in twenty-eight years, its second since the Contest's inception, and its first win as a unified country. It was also the first time a "Big Four" country won the contest since the rule's introduction in 2000. The semi-finals took place on 25 and 27 May 2010 while the final took place on 29 May 2010. The European Broadcasting Union (EBU) announced that the voting system used in the semi-finals would change from previous years to balance jury voting with televoting. A return of accompaniment by orchestra was also proposed, but did not happen. Thirty-nine countries took part in the contest, with Georgia returning after a one-year hiatus, and Andorra, the Czech Republic, Hungary, and Montenegro withdrawing. Lithuania originally announced its withdrawal from the competition, but was later among the 39 participants confirmed by the EBU. A global financial crisis affected how the event was run; several countries elected not to compete due to budget cuts, and host broadcaster NRK sold its broadcast rights for the 2010 FIFA World Cup to TV 2 and Viasat to finance the event.Notably it was also the first time since the introduction of the semi-finals in 2004 that Sweden failed to qualify for the final. The last time Sweden was absent from the Eurovision final was in 1976. Jens Stoltenberg (born 16 March 1959) is a Norwegian politician who has been serving as the 13th Secretary General of NATO since 2014. A member of the Labour Party, he was Prime Minister of Norway from 2000 to 2001 and from 2005 to 2013. In 2011, Stoltenberg received the United Nations Foundation's Champion of Global Change Award, chosen for his extraordinary effort toward meeting the Millennium Development Goals and bringing fresh ideas to global problems.The mission of Jens Stoltenberg as secretary general of the North Atlantic Treaty Organization (NATO) was extended for another two years. Stoltenberg has been responsible for the past five years and is set to lead NATO until 2022. Norway (Norwegian: Norge (Bokmål) or Noreg (Nynorsk); Northern Sami: Norga; Southern Sami: Nöörje; Lule Sami: Vuodna), officially the Kingdom of Norway, is a Nordic country in Northern Europe whose territory comprises the western and northernmost portion of the Scandinavian Peninsula; the remote island of Jan Mayen and the archipelago of Svalbard are also part of the Kingdom of Norway. The Antarctic Peter I Island and the sub-Antarctic Bouvet Island are dependent territories and thus not considered part of the kingdom. Norway also lays claim to a section of Antarctica known as Queen Maud Land. Norway has a total area of 385,207 square kilometres (148,729 sq mi) and a population of 5,312,300 (as of August 2018). The country shares a long eastern border with Sweden (1,619 km or 1,006 mi long). Norway is bordered by Finland and Russia to the north-east, and the Skagerrak strait to the south, with Denmark on the other side. Norway has an extensive coastline, facing the North Atlantic Ocean and the Barents Sea. Harald V of the House of Glücksburg is the current King of Norway. Erna Solberg has been prime minister since 2013 when she replaced Jens Stoltenberg. A unitary sovereign state with a constitutional monarchy, Norway divides state power between the parliament, the cabinet and the supreme court, as determined by the 1814 constitution. The kingdom was established in 872 as a merger of a large number of petty kingdoms and has existed continuously for 1,147 years. From 1537 to 1814, Norway was a part of the Kingdom of Denmark-Norway, and from 1814 to 1905, it was in a personal union with the Kingdom of Sweden. Norway was neutral during the First World War. Norway remained neutral until April 1940 when the country was invaded and occupied by Germany until the end of Second World War. Norway maintains the Nordic welfare model with universal health care and a comprehensive social security system, and its values are rooted in egalitarian ideals. The Norwegian state has large ownership positions in key industrial sectors, having extensive reserves of petroleum, natural gas, minerals, lumber, seafood, and fresh water. The petroleum industry accounts for around a quarter of the country's gross domestic product (GDP). On a per-capita basis, Norway is the world's largest producer of oil and natural gas outside of the Middle East.The country has the fourth-highest per capita income in the world on the World Bank and IMF lists. On the CIA's GDP (PPP) per capita list (2015 estimate) which includes autonomous territories and regions, Norway ranks as number eleven. It has the world's largest sovereign wealth fund, with a value of US$1 trillion. Norway has had the highest Human Development Index ranking in the world since 2009, a position also held previously between 2001 and 2006. It also had the highest inequality-adjusted ranking until 2018 when Iceland moved to the top of the list. Norway ranked first on the World Happiness Report for 2017 and currently ranks first on the OECD Better Life Index, the Index of Public Integrity, and the Democracy Index. Norway has one of the lowest crime rates in the world. The Norwegian Campaign was the attempted Allied liberation of the Scandinavian nation of Norway from Nazi Germany during the early stages of World War II and directly following the German invasion and occupation of the Norwegian mainland and government. It took place from April 9, 1940, until June 10, 1940. The Allied campaign did not succeed, and it resulted in the fleeing of King Haakon VII along with the remainder of the royal family to Great Britain. In April, the United Kingdom and France came to Norway's aid with an expeditionary force. Despite moderate success in the northern parts of Norway, the Allies were eventually compelled to withdraw by Germany's invasion of France in May, and the Norwegian government sought exile in London. The campaign ended with the occupation of Norway by Germany, and the continued fighting by exiled Norwegian forces from abroad. The 62 days of fighting made Norway the nation that withstood a German land invasion for the second longest period of time, after the Soviet Union. The Norwegian Football Cup (Norwegian: Norgesmesterskapet i fotball for herrer) is the main knockout cup competition in Norwegian football. It is run by the Football Association of Norway and has been contested since 1902, making it the oldest football tournament in the country. The tournament is commonly known as Cupen ("The Cup") or NM, an acronym formed from Norgesmesterskap ("Norwegian Championship"). These terms are used to describe both the men's and women's competitions. The equivalent competition for women's teams is the Norwegian Women's Football Cup. The Norwegian Football Cup is a national championship, meaning that while the Eliteserien may be the most prestigious competition to win, it is the winners of the Cup who are awarded the title "Norwegian football champions". This differs from, for example, English football, where the winners of the FA Premier League are the ones who become English champions. Winners receive the King's trophy. Winners also qualify for the Europa League second qualifying round and a place in the Mesterfinalen, the Norwegian super cup match. The current Norwegian champions and holders of the cup are Rosenborg, who defeated Strømsgodset 4–1 in the 2018 final. Odd and Rosenborg are the most successful clubs with 12 titles each. Oslo Airport (Norwegian: Oslo Lufthavn; IATA: OSL, ICAO: ENGM) is the main international airport serving Oslo, Norway, the capital and most populous city in the country. A hub for Scandinavian Airlines and Widerøe, and an operating base for Norwegian Air Shuttle, it connects to 26 domestic and 152 international destinations. 28,5 million passengers traveled through the airport in 2018, making it the second-busiest commercial airport in the Nordic countries, and the nineteenth-busiest in Europe. The airport is located 19 nautical miles (35 km; 22 mi) northeast of Oslo, at Gardermoen in the municipality of Ullensaker, in Akershus county. It has two parallel roughly north–south runways measuring 3,600 metres (11,811 ft) and 2,950 metres (9,678 ft) and 71 aircraft stands, of which 50 have jet bridges. 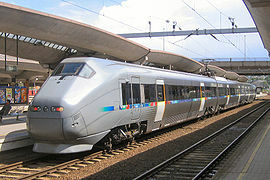 The airport is connected to the city center by the high-speed railway Gardermoen Line served by mainline trains and Flytoget. The percentage of passengers using public transport to get to and from the airport is one of the highest in the world at nearly 70%. The ground facilities are owned by Oslo Lufthavn AS, a subsidiary of the state-owned Avinor. Also at the premises is Gardermoen Air Station, operated by the Royal Norwegian Air Force. An expansion with a new terminal building and a third pier opened in late April 2017. Oslo is also served by the low-fare airport Torp in Sandefjord, situated 119 km to the south of downtown Oslo. The airport location was first used by the Norwegian Army from 1940, with the first military airport facilities being built during the 1940s. The airport remained a secondary reserve and airport for chartered flights to Oslo Airport, Fornebu until 8 October 1998, when the latter was closed and an all-new Oslo Airport opened at Gardermoen, costing 11.4 billion Norwegian kroner (NOK). Oslo Central Station (Norwegian: Oslo sentralstasjon, abbreviated Oslo S) is the main railway station in Oslo, and the largest railway station within the entire Norwegian railway system. It is the terminus of Drammen Line, Gardermoen Line, Gjøvik Line, Hoved Line and Østfold Line. It serves express, regional and local rail services by four companies. The railway station is operated by Bane NOR while its real estate subsidiary, Bane NOR Eiendom owns the station, and was opened in 1980. 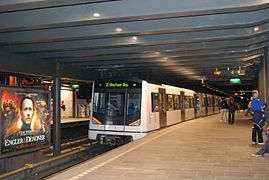 The Oslo Metro (Norwegian: Oslo T-bane or Oslo Tunnelbane or simply T-banen) is the rapid transit system of Oslo, Norway, operated by Sporveien T-banen on contract from the transit authority Ruter. The network consists of five lines that all run through the city centre, with a total length of 85 kilometres (53 mi), serving 101 stations of which 17 are underground or indoors. In addition to serving 14 out of the 15 boroughs of Oslo (except St. Hanshaugen), two lines run to Kolsås and Østerås, in the neighboring municipality of Bærum. In 2016, the system had an annual ridership of 118 million.The first rapid transit line, the Holmenkoll Line, opened in 1898, with the branch Røa Line opening in 1912. It became the first Nordic underground railway in 1928 when the underground line to Nationaltheatret was opened. After 1993 trains ran under the city between the eastern and western networks in the Common Tunnel, followed by the 2006 opening of the Ring Line. All the trains are operated with MX3000 stock. These replaced the older T1000 stock between 2006 and 2010. Oslo Stock Exchange (Norwegian: Oslo Børs) (OSE: OSLO) is the only independent stock exchange within the Nordic countries and offers Norway’s only regulated markets for securities trading today. The stock exchange offers a full product range including equities, derivatives and fixed income instruments. The University of Oslo (Norwegian: Universitetet i Oslo), until 1939 named the Royal Frederick University (Norwegian: Det Kongelige Frederiks Universitet), is the oldest university in Norway, located in the Norwegian capital of Oslo. Until 1 January 2016 it was the largest Norwegian institution of higher education in terms of size, now surpassed only by the Norwegian University of Science and Technology. The Academic Ranking of World Universities has ranked it the 58th best university in the world and the third best in the Nordic countries. In 2015, the Times Higher Education World University Rankings ranked it the 135th best university in the world and the seventh best in the Nordics. While in its 2016, Top 200 Rankings of European universities, the Times Higher Education listed the University of Oslo at 63rd, making it the highest ranked Norwegian university.The university has approximately 27,700 students and employs around 6,000 people. Its faculties include (Lutheran) Theology (with the Lutheran Church of Norway having been Norway's state church since 1536), Law, Medicine, Humanities, Mathematics, natural sciences, social sciences, Dentistry, and Education. The university's original neoclassical campus is located in the centre of Oslo; it is currently occupied by the Faculty of Law. Most of the university's other faculties are located at the newer Blindern campus in the suburban West End. The Faculty of Medicine is split between several university hospitals in the Oslo area. The university was founded in 1811 and was modeled after the University of Copenhagen and the recently established University of Berlin. It was originally named for King Frederick VI of Denmark and Norway and received its current name in 1939. The university is informally also known as Universitetet ("the university"), having been the only university in Norway, until 1946 and was commonly referred to as "The Royal Frederick's" (Det Kgl. Frederiks), prior to the name change. The Nobel Peace Prize was awarded in the university's Atrium, from 1947 to 1989, making it the only university in the world to be involved in awarding a Nobel Prize. Since 2003, the Abel Prize is awarded in the Atrium. Five researchers affiliated with the university have been Nobel laureates. Vålerenga Fotball (Norwegian pronunciation: [²voːlərəŋɑ] or [²voːɽəŋɑ] (listen)) is a Norwegian association football club from Oslo and a part of the multi-sport club Vålerengens IF. Founded in 1913, the club is named after the neighbourhood of Vålerenga. Vålerenga's home ground is Intility Arena, located in Valle-Hovin. Vålerenga are five-time league champions and four-time Norwegian Football Cup champions, having last won the league in 2005 and the cup in 2008. The Oslo II Accord divided the Israeli-occupied West Bank into three administrative divisions: Areas A, B and C. The distinct areas were given different statuses, according to their governance pending a final status accord: Area A is exclusively administered by the Palestinian Authority; Area B is administered by both the Palestinian Authority and Israel; and Area C, which contains the Israeli settlements, is administered by Israel. Areas A and B were chosen in such a way as to just contain Palestinians, by drawing lines around Palestinian population centers at the time the Agreement was signed; all areas surrounding Areas A and B were defined as Area C.Area A comprises approximately 18% of the West Bank and Area B about 22%, together home to some 2.8 million Palestinians. As of 2015, Area C is home to 150,000 Palestinians in 532 residential areas. It is also home to 389,250 Israelis, in 135 settlements, as well as 100 outposts unrecognized by the Israeli government. Area C forms a contiguous territory, administered via the Judea and Samaria Area administration. In contrast, under the Oslo Accords Areas A and B were subdivided into 165 separate units of land that have no territorial contiguity.